Crafting Provisioning Guide for Elder Scrolls Online with details how to level fast and buff the stats of your character significantly through Food and Drinks. 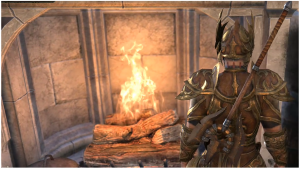 Food and Drinks are very useful in Elder Scrolls Online because food increases Max Magicka, Health and Stamina while drinks increase Magicka, Health and Stamina Recovery. Provisioning is one of the easier vocations to take on but crafting Gold Quality consumables is a grind. Please note that Food and Drinks DO NOT STACK in any shape or form. To start Provisioning, visit any Cooking Fire. Cooking Fires can be found in Taverns in every City and scattered around the world in Camps. To get certified and eligible for Provisioning Writs, visit Daniel Telleno in any starting area Mages Guild and Alinor in Summerset. The first thing needed for crafting Food and Drinks is the recipe and you cannot craft without them. Recipes are acquired randomly by looting crates and barrels. The easiest way to obtain recipes is to visit Guild Traders and buy it from there, since they have lots of recipes to offer for cheap prices, or simply by looting EVERY container you see. Some basic green recipes can also be bought from Chefs and Brewers. Chefs and Brewers can be found in almost every Tavern near Cooking Fire. Provisioning Materials are acquired by killing animals, looting crates, barrels, sacks, by buying them for Grocers or Guild Traders. The best method to acquire lots of materials is to run Dungeons and loot every crate, barrel and sack. Meat can be obtained by killing any animals, hostile or neutral. Chickens, Guars, Monkeys, Sheep, Does… Everything drops some kind of meat. Just be careful if its livestock because killing livestock is considered as crime. So…only do it when no one is around. As with all crafting skills, you will need to earn and spend Skill Points to further your capacity within the craft. You can earn Skill Points by completing Quests, collecting Skyshards and ranking up in PvP. The Recipe Quality passive enables crafting of higher quality Food and Drinks. It is not important for leveling but very important for end game when you want your character as buffed as possible. 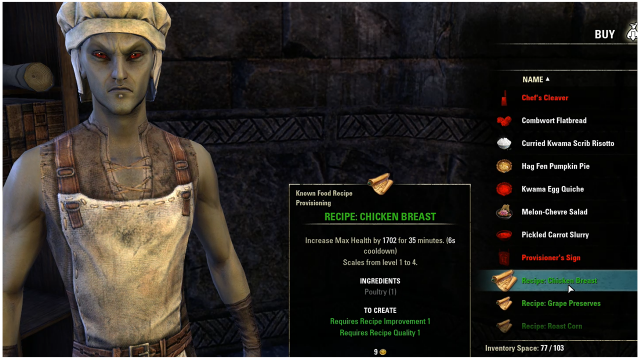 The Recipe Improvement passive enables crafting of higher level Food and Drinks. It is important for leveling because crafting the highest level possible yields the most Inspiration. Upgrade this one as soon as possible. The Gourmand passive adds to duration of any Food consumables. Very useful throughout game. Upgrade when possible. The Connoisseur passive adds to duration of any Drink consumables. Also very useful throughout game and should be upgraded when possible. The Chef passive increases amount of Food you get by crafting it. At max Rank 4 servings are created per single recipe crafting. This is much more useful later on when crafting specific high level food for your character. The Brewer passive does the same as Chef passive, only for Drinks. More servings per Drink recipe crafted. The Hireling collects Provisioning Materials when you are offline. This one is very useful and should be upgraded as soon as possible for a chance of acquiring rarer materials. Leveling Provisioning is an easy task because the only way to gain Inspiration is by crafting Food and Drinks. Writs are good source of Inspiration and should be done whenever possible because, in addition to Inspiration, they have a chance to reward Rare Provisioning Materials. Recipes needed to complete Writs are usually obtained through Chefs and Brewers. If not available at these Vendors, just check Guild Traders and obtain them there. The fastest and most efficient way of leveling Provisioning, next to doing Writs, is by always crafting highest level Green Recipe until reaching enough Provisioning Ranks for Recipe Improvement passive to be upgraded. Recipe used does not matter. Use always the one that you have most materials for at that moment. 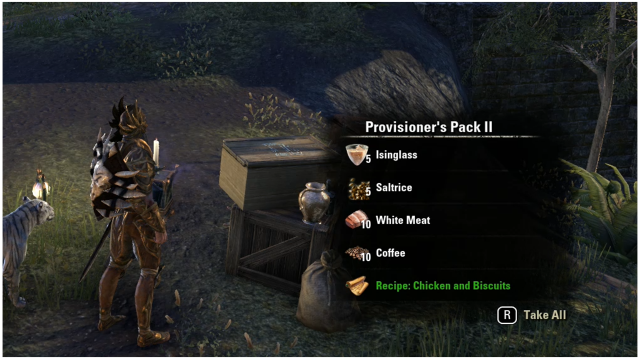 Psijic Ambrosia is the most popular Provisioning item in the game. It gives a 50% XP Boost from all Sources for 30 mins and it is the only Provisioning item that stacks with other Food and Drinks. Crafting Psijic Ambrosia is a daunting task but can pay off tremendously in the end. Recipe Improvement and Recipe Quality need to be upgraded fully in order to craft this amazing drink. 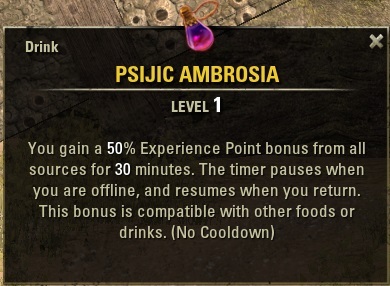 It is highly recommended to have Connoisseur and Brewer passives upgraded to maximum before crafting Psijic Ambrosia, to extend duration of the drink and to get more Ambrosias per one recipe crafted. Recipe is obtained from Daily Provisioning Writs only, making it extremely difficult to acquire. 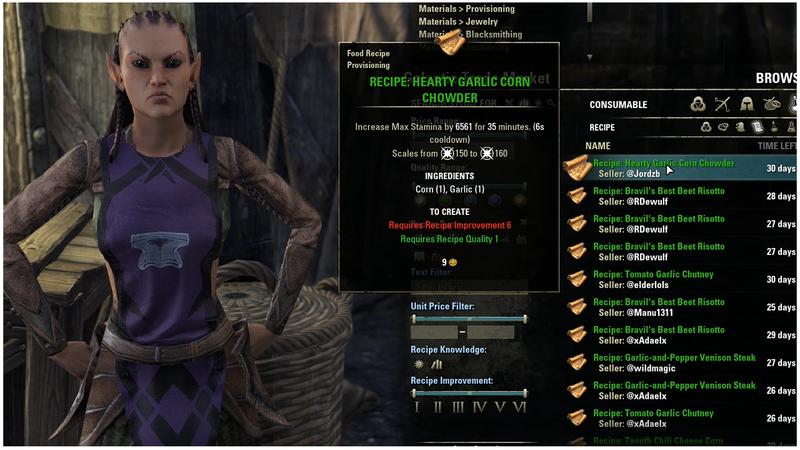 To top that off, you need 7 Recipe pieces to combine them into final Psijic Ambrosia recipe. More often than not you will obtain several of one Fragment before you get all those you need. You may want to consider trading your extras for the ones you need, or buying them from Guild Traders. To craft Psijic Ambrosia 3 ingredients are needed: Perfect Roe, Frost Mirriam and Bervez Juice. Perfect Roe drops from Fish only so be prepared to do a lot of Fishing. The easiest way is to just catch Common Fish and use it in your inventory. 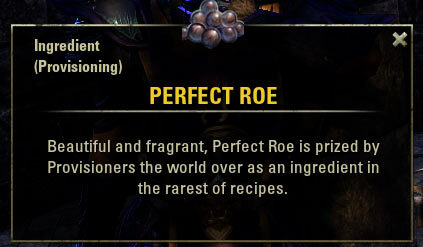 If you are lucky, you will gain at least 1 Perfect Roe. However, you can trade other players for this if you wish. Frost Mirriam and Bervez Juice are obtained through Daily Provisioning Writs and Hirelings Only. These items are on sale at Guild Traders all the time but be prepared to pay high price for them. 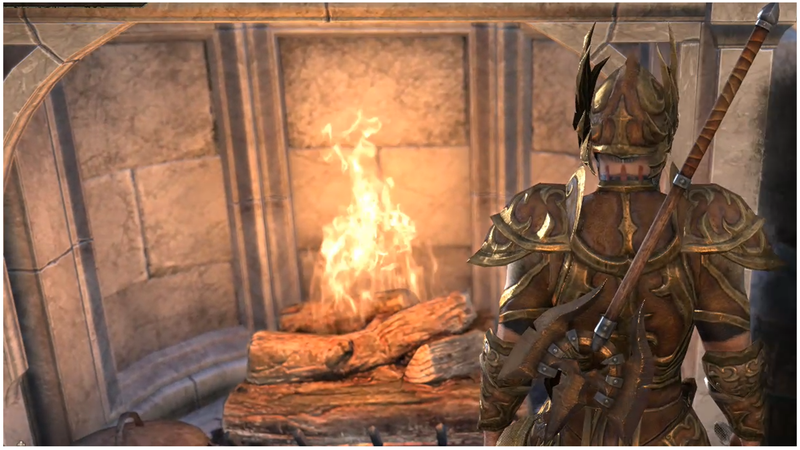 ESO Provisioning Crafting is one of the easier and most useful crafting vocations. It is fast to level up and provides big boosts through Food and Drinks throughout the game, making it useful all the time. 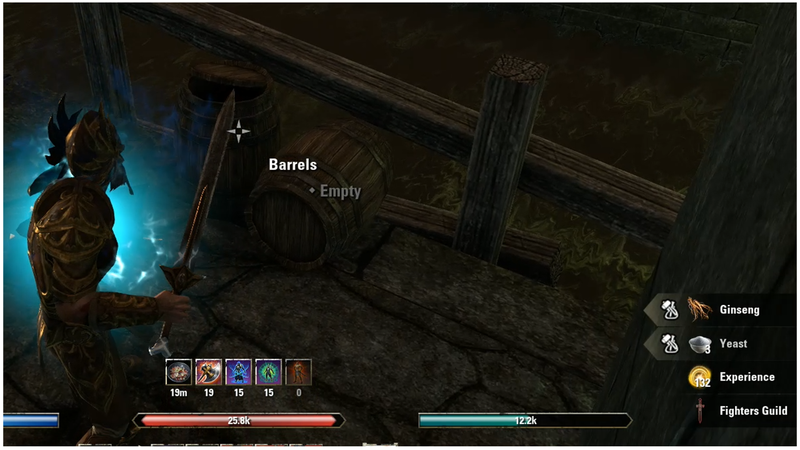 Materials are gathered by looting crates, barrels and sacks, making Dungeons the best method of acquiring lots of Provisioning Materials. Guild Traders and Guild Stores are also great source for recipes and materials. This particular vocation requires a lot of space due to the wide variety of Ingredients needed compared to other professions. Make sure you take this into account when choosing this vocation and plan accordingly. You should never need more than about 200 of each Ingredient, so also consider selling or trading off the extras in order to save space.